Even though I'm in my 30's now, I still love watching Anime, more especially the ones with a great story and enough power to destroy the world itself! 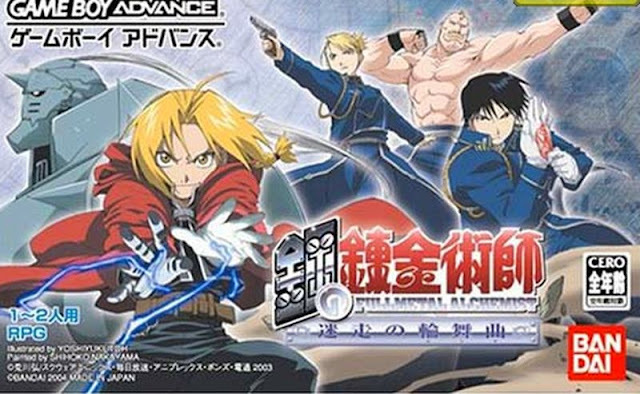 So it stands to reason why I was a huge fan of the Japanese Animation ' Full Metal Alchemist ', which Hagane no Renkinjutsushi : Meisou no Rinbukyoku on the GBA is based on. Sadly however, unlike the Animation which was able to be watched worldwide, the GBA version was only ever released in Japan and wasn't in English, at least until now. Fullmetal Alchemist: Stray Rondo is a role playing game for the Gameboy Advance published by Bandai in 2004 in Japan, but now thanks to mz and x_comp, the entire game is playable in English, which means English speaking Full Metal Alchemist fans ( Yeh that's me too ), can finally play the game and enjoy it from beginning to end! Please note you will need a patching program such as beat or Floating IPS to add the hack/patch to the main No-Intro: Hagane no Renkinjutsushi - Meisou no Rondo (Japan) ROM, which isn't available here.